I replaced the emergency brake cables and rear brake hose on my XJ Cherokee with longer YJ Wrangler versions. The taller lift I got when I added the Dana 44 and the OME AALs was stretching... literally... the limits of the cables and hose. A broken rear brake hose was not what I wanted! Fortunately the upgrade to longer pieces was not difficult. Longer YJ rear brake hose installed on the XJ. There's plenty of slack now. The most important upgrade was replacing the rear brake hose with a longer version. 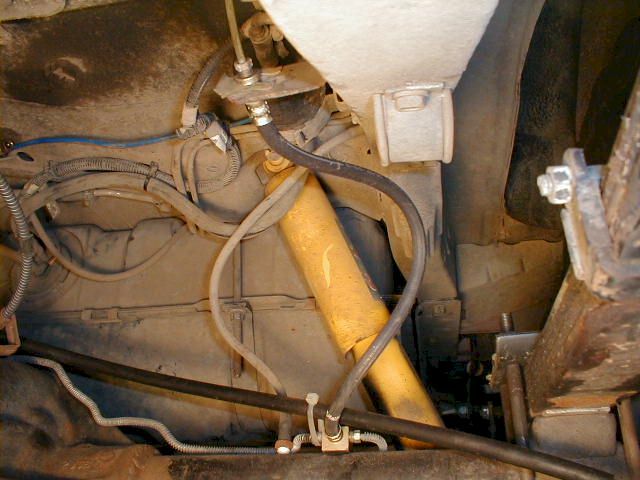 The hose in question is the flexible line that runs from the body-mounted hard lines to the axle-mounted hard lines. The stock version has plenty of flex for a stock suspension, but the extra inch I got when I went from 3.5" to 4.5" of lift pushed the tough rubber unit past the safety point. There are lots of choices for replacement lines, including a longer stock hose originally spec'd for a YJ Wrangler and multiple sources for stainless steel lines. The stainless lines are popular and are available in multiple sizes. Unfortunately, there seems to be a wide range of quality built in to these hoses. Some people swear by them, but others have had theirs come apart on the trail. Perhaps the problematic hoses were not DOT approved. To avoid this kind of trouble, I went with the tried and true stock rubber type. Tough? They're more than tough enough. The YJ hose, part number 52004152, is 17 3/4" long. That's about 2 3/4" longer than the stock XJ hose. It's more than long enough for my lift and is probably long enough for up to a 6" lift. Make sure the hose is correct before you buy. Also make sure you don't work on your brake system unless you know what you're doing. A competent brake shop will be able to perform this simple upgrade in a couple of hours, perhaps less. Don't take a chance with your brake system. Get the job done correctly. XJ (from my '90) 14 1/2"
Emergency brake cable replacement is a little more complicated and perhaps not as critical. It's a job worth doing, though, because it gives you enough slack to lift your XJ to the sky. 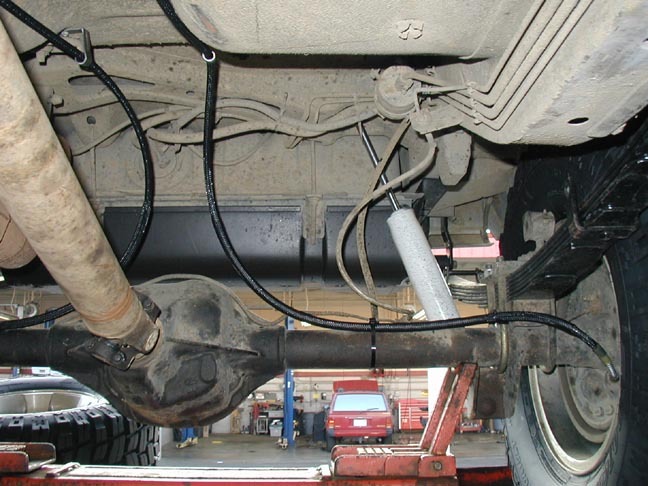 You'll see if you can benefit from the longer cables if your passenger-side cable is hanging up on your muffler. My muffler had a lot of wear marks from the stock cable rubbing on it. It was certainly hindering articulation and probably causing enough damage to eventually break something. 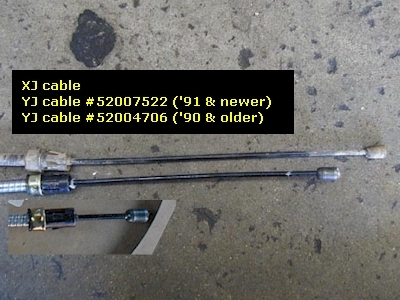 E-brake cable comparison. The middle cable is the correct YJ cable for the upgrade. Two ways to route the new, longer YJ cables. My XJ (right) has less lift than Mike's, so I routed my cables by having them cross. 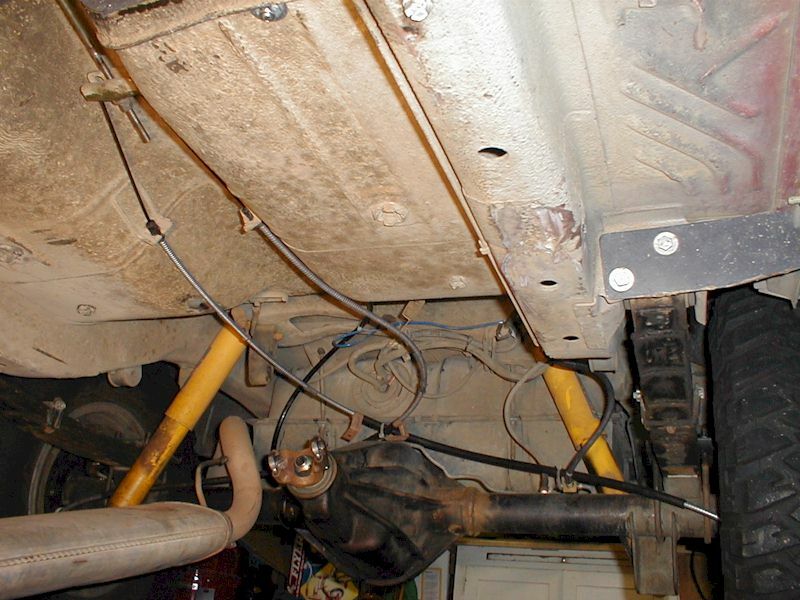 The trick is replacing the two equal-length XJ cables with two YJ passenger's side e-brake cables. Unlike the XJ's center hand brake, the '91 and newer YJs have a left-foot e-brake lever. That means the passenger side cable must be a Wrangler's width longer than the driver's side cable. For us XJers, it means we have an almost modification-free upgrade. I say "almost" because the exposed cable end (opposite the brake end) is a little shorter than the stock XJ cable. Take a look at the images and you'll see the difference in cable length... about an inch and a half. The job is just a matter of lengthening the e-brake actuation rod by a few inches with a piece of 8-mm all-thread. There are two methods of doing the job... three if you count my lame jury-rigged cable clamp method. I don't recommend the clamps, but it did work for a while. In either case you'll need to cut most of the existing threads away from the rod, leaving, say, an inch of threads. 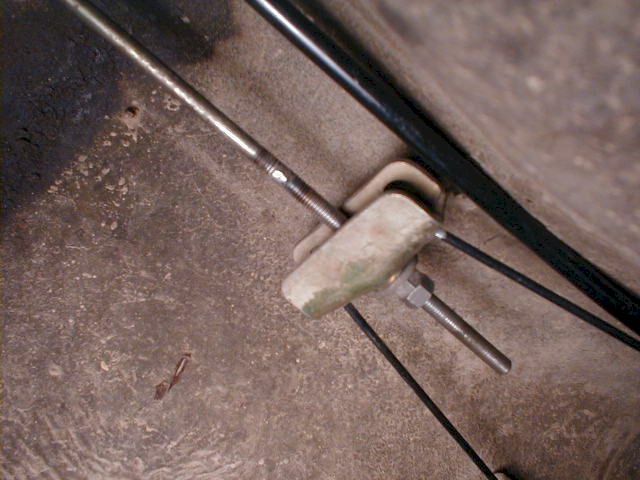 Three ways to extend the e-brake rod: An all-thread connector nut with jamb nuts is used on the left. The center image is a temporary hack using wire cable clamps. For a permanent solution, I welding the all-thread extension. The first method comes via XJ expert Mike R. He leaves enough original thread to fit an all-thread connector nut with jamb nuts. Spin on the jamb nuts and connector nut, centering the threaded rods evenly on the big nut. You might use a bit of tape on each rod to make sure the rods are centered. Lock down the jamb nuts and reassemble. Method number two is no more effective, but it's a lot more macho. In spite of a county-wide search, I was unable to find an all-thread connecting nut. (It's a small county... oh well!) I put my newly borrowed wire-feed MIG machine to good use and welded on the extra length of 8-mm all-thread. You can see in the images that I've got plenty of extra thread. Better more than too little! Simply line up the two pieces and blast away. I beveled both rod ends to assure full penetration of the weld. It was the first welding I had done in a lot of years, so I was very proud of my huge glob of metal. It filed down nicely, don't you think? The toughest part of the job is disassembling the rear drums and replacing the cable on the backing plate. This job took place for me in the midst of putting together a Dana 44, so it was no problem. The brakes on the 44 were shot and we had everything disassembled anyway. One mistake I made was ordering the wrong cables. That cost me a restocking fee (our Jeep dealer subs for the Devil now and then), but now you won't make the same mistake. I ordered the cables from a '90 YJ because I had a '90 XJ. Wrong. I needed '91 and newer YJ cables (part number 52007522), and so does every other XJ, I suspect. 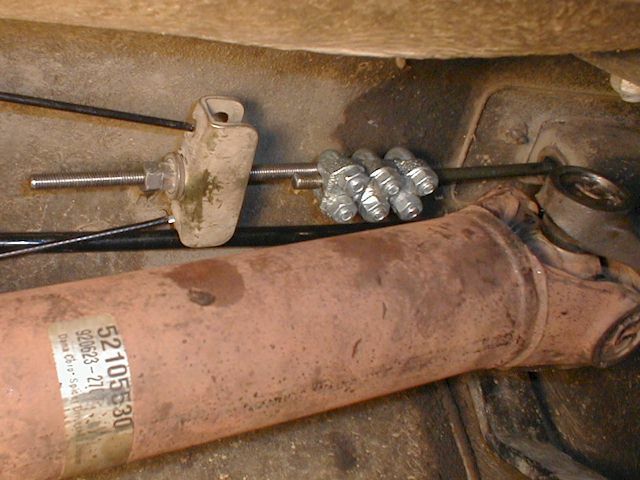 XJ (from my '90) 38 3/4" 54" 0" 0"
Like with the brake hose, make sure the e-brake cable replacement is done correctly. There are some important adjustments that have to be done to the e-brake system. If you're in doubt, have a competent brake shop do the job. Replacing the existing, too-short rear brake hose and e-brake cables is a nice upgrade. It's mandatory for lifts over about four inches. Fortunately both replacements are straight-forward and easy to complete in an afternoon. 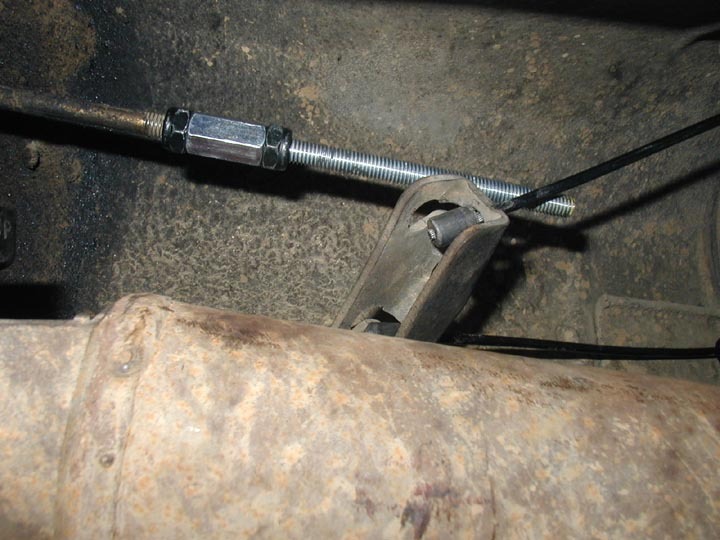 If your e-brake cables are rubbing and hindering articulation, think about an upgrade to YJ cables. If the rear brake hose is even close to it's slack limit, don't take a chance. Replace that short stock hose with the longer YJ hose as soon as possible.